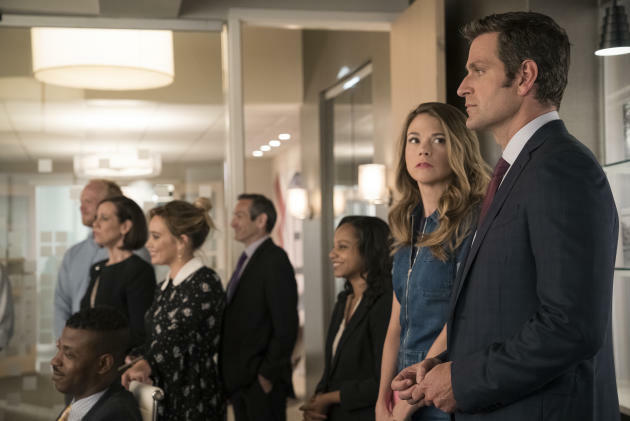 Younger is finally back with its third season, which has promised to deliver! Season two ended with such great moments that I wasn’t sure exactly how this new season would move forward from there. What I can see from this first episode is that things are going to get even messier and more complicated. But that’s just a great thing for us viewers, even if it’s not so great for Liza. As we know, Josh told Liza that he was “all in,” and he’s keeping true to that promise. He even stops by Maggie’s loft and brings donuts to send Caitlyn off, back to school. He’s serious about this relationship, and even Caitlyn tells Liza that she’s seeing potential in her mother’s relationship with a 26 year old. Maggie is digging Josh 2.0, as she calls him. Liza on the other hand is not “all in.” She finally confesses to Maggie about the stellar kiss she shared with Charles and how that kiss has her feelings jumbled up. Maggie makes a great point: Who doesn’t want a boyfriend that will love you and lie for you too? Charles comes with a lot of baggage… and also thinks that Liza is 26 years old. So, why rock the boat? Back at work, Kelsey is still trying to cope with Thad’s death. Chad is trying to help her hack into Thad’s computer, much to Liza’s dismay. Thad’s computer holds Liza’s true identity. Chad meanwhile is using this situation to get closer to Kelsey… which is creepy, upsetting and breaks total (literal) bro code. Gross. Kelsey is thankfully not interested in Thad or anyone. She hasn’t processed what’s happened and Lauren tries to help her by taking her to equestrian therapy. Kelsey is able to open up to Mike (the horse) and admits how guilty she feels for being relieved to not have to marry Thad when she found out he was dead. Liza later comforts her and tells her this makes her human. This comes after a wild night out with Diana, who invites Kelsey to a bar to blow off some steam. In the end, Diana ends up horribly drunk and getting rid of her old wedding dress, which made for a very awkward next day at work. The next day at work was awful and awkward for everybody,really. The night before, Charles had asked Liza to meet him for dinner if she was interested in pursuing this connection further. If she didn’t show up, they would continue on as if their kiss never happened. Now, let it be known that Liza even lied to Josh about her whereabouts to go meet with Charles! She had full intentions to see where things could go! However, as fate would have it, as Liza was walking in she sees Charles is chatting with a married couple who happen to be the parents of Caitlyn’s friend. Hence, they know her as a 40-year-old mother to a college student. She dashes out of the restaurant before being seen and texts Charles she isn’t able to make it. Upon reading the text, Charles looks devastated! The next day at work, Liza heads over to clear the air between them. Let me tell you, the air was icy. Charles didn’t let Liza explain herself, simply and coldly telling her “a kiss is just a kiss,” and firmly says they need to move on. Liza is shocked. Now, yes, I understand that Charles is embarrassed about Liza not showing up, but it’s certainly not an excuse for him to act childish and so cutthroat. It was unnecessary, and he could have let her explain. Charles lost some points in my book in this season premiere episode, so I’m slightly leaning more towards #TeamJosh. Leave your comments below on where you stand with Liza’s love triangle!